These are the traces you leave behind, your prescriptions, applications for reimbursement, outdated resumes, shopping lists. You imagine that, after you're gone, someone will follow one to another and try to reconstruct you. A biographer, a grandchild not yet even thought of. A scrap of a to-do list posted on Facebook like Woody Guthrie's "Wash teeth, if any." Your sixth grade essay on your mother's face will be found an early classic, a sign of greatness. The greatness that for now, eludes you. Every day more paper slips in through the letter slot in your door, every day the pile on your desk grows deeper, and you remember when people talked about a paperless society, and all you can do is laugh. Buried somewhere under those receipts and bills is the kernel of your bright and innocent heart. 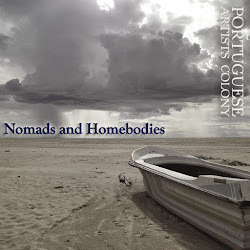 Start clean with Portuguese Artists Colony on May 5th at our fresh new venue, The Make-Out Room. David Rocklin is the author of the 2011 novel The Luminist. He is also the founder of Roar Shack reading series in Los Angeles. He is currently at work on his new novel, The Daylight Language. Zoë Ruiz is the Saturday Editor for The Rumpus and staff member of FOUND magazine. Her work has appeared in The Rumpus, Two Serious Ladies, and Fine Print. Currently she’s working on her interview project “Learn People Better” and curates READINGS, a Los Angeles based reading series. Aisha Sloan's work has been published in Ninth Letter, Identity Theory, Michigan Quarterly Review and The Southern Review. Her first book of essays, The Fluency of Light: Coming of Age in a Theater of Black and White was published by the University of Iowa Press in 2013. Fun fact: both Aisha and Zoë teach yoga. PLUS! 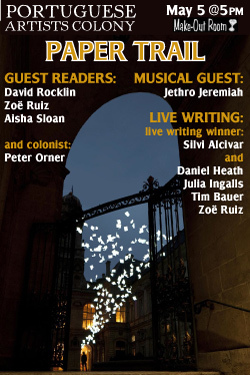 Live writing winner Silvi Alcivar will be back with her finished piece, and new work from Colonist Peter Orner. Fabulous music from Jethro Jeremiah. This month's live writing matchup is an epic throwdown between Portuguese Artists Colony and our Los-Angeles-based sister series, Roar Shack. Place your bets now!